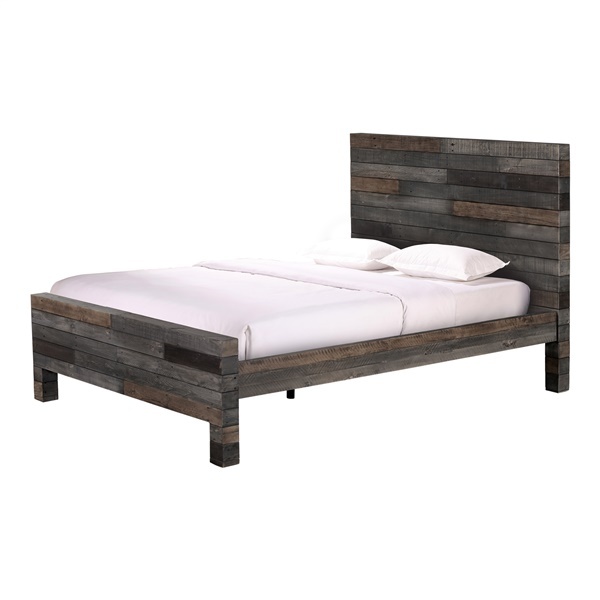 Far from boring, but still sure to put you right to sleep, the Vintage Bed by Moe’s Home is not only available in your choice of sizes to best suit your space, but is also an example of environmentally friendly craftsmanship of recycled pine. Built in a clean-lined design that manages to be both rustic and refined, Moe’s Vintage Bed features a fun look of various finishes, making it unique in appearance yet easy to incorporate. On its own or accented with Moe’s many other Vintage bedroom pieces, the Vintage Bed by Moe’s is as ideal in an eclectic aesthetic as it is in a contemporary area. Rustic yet refined contemporary design. Eco-friendly construction of recycled pine. Distressed details for visual and textural appeal. Coordinates with other Vintage pieces by Moe’s. Is a boxspring required for this bed? Since this bed has slats, it is recommended to use a low profile boxspring or bunky board.